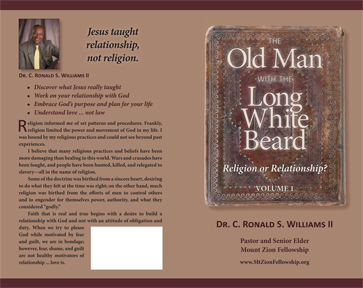 THE OLD MAN WITH THE LONG WHITE BEARD: RELIGION OR RELATIONSHIP? Editing by Joanne Shwed (www.AuthorOneStop.com). Cover/interior design and production by Backspace Ink. © 2012 Dr. C. Ronald S. Williams II, St. Clare Ventures, 60 pages, softcover.